In an age of rampant skepticism and misinformation concerning the origin of the Bible, it is of vital importance for the church to understand not only the process of canonization, but the early church’s view on the authenticity of the books canonized. There is no doubt that any believer who interacts on any level in the world today will sooner or later be asked the question, “Where did we get the Bible?” The modern assumption held by most individuals as a result of pop-fiction and modern academia is that the church itself simply “chose” through counciliar process to arbitrarily compile the books we know today as the Old and New Testaments. This of course erodes the foundation of Christianity itself, making the faith equivalent to every other man-made religious system. It is more than a little ironic that the stalwarts of the Christian faith in the early church (the very group of men accused of tampering with and/or choosing the text of Scripture) were the very ones contradicting this assertion, instead holding to what has come to be known since the reformation as sola sciptura. This work is dedicated to vindicating the doctrine for which they stood, thereby arming the modern Christian with an answer to give to those who would carry such faulty assumptions concerning the sacred cannon. The canon of Scripture was not determined authoritative by a “more” authoritative establishment, namely the church, but was confirmed by the church as an entity already possessing supreme authority over the institution that verified its reliability. 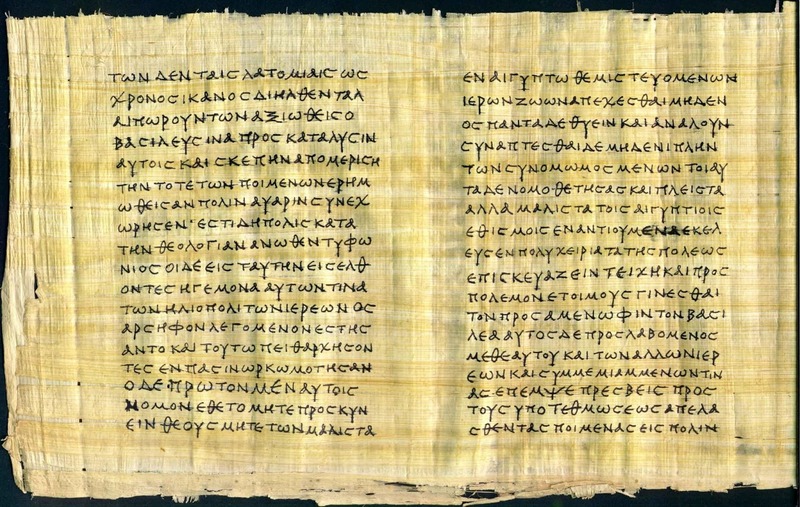 The Scriptures, in their original characteristic, are not made a standard by any humanly devised system of veracity, but stand in judgment themselves over any such system.The Scriptures are self-confirming and have been treated universally as such by Christians, including those of the early and patristic periods. It is the aim of this work to demonstrate, using historical evidence, that the early and patristic church believed in a self-confirming and authoritative canon that they themselves sat in judgment underneath. The early church believed in sola scriptura. “The term canon transliterates the Greek κανoν (kanon), which in turn derives from a Semitic word for reed (used to measure length by).” The Greek word is used in Galatians 6:16 to refer to the “rule” of faith in Jesus Christ. A “canon is the closed list of books that was officially accepted retrospectively by a community as supremely authoritative and binding for religious practice and doctrine.” The Christian canon therefore is codified in the 66 books of the Old and New Testaments that convey the rule of faith in Jesus Christ. The term “Scripture” simply refers to the “written word” and parallels this definition. For the purposes of this work the word canon, Scripture, and Bible—which literally means “book”—will be used synonymously. One of the greatest sources of confusion concerning the cannon stems from conflating the process of canonization with the authority of the canon. Modern academia tends to assume that process gave rise to authority, when in reality authority gave rise to process. The church did not grant the Scriptures their authority by compiling them. Rather, the authority of the Scriptures themselves legitimized the process the church took in recognizing them as such. The early church believed the canon existed independent from and ontologically over the church. While the no known original autographs of New Testament Scripture are known to still exist, we do have “nearly 25,000 manuscripts or fragments of manuscripts . . . among these are nearly 5,800 Greek manuscripts . . . which is over three times as many as for the Iliad.” The sheer volume of available manuscripts allows scholars to confidently reconstruct the autographs thereby easily solving most issues concerning variant readings. Furthermore, no church counsel—due to geographical transmission and manuscript abundance—could have physically eradicated a biblical text it disagreed with. There are four basic groups of New Testament fragments organized by the material used in their transmission: The papyri, the uncials, the minuscules, and the lectionaries. 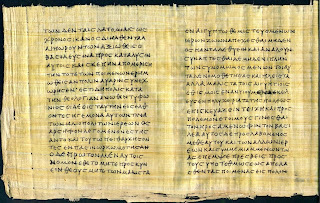 The papyri were written in Greek and date from the 2nd through 7th centuries (there are currently ninety-nine fragments in existence); there are three hundred uncials dating from the 3rd to 11th centuries; 2,800 minuscules (the earliest of which date from the 9th century); and 23,000 lectionaries dating from the 6th century and later. These texts have been broken down into significant manuscripts and through the process of comparing and contrasting (textual criticism) have been used by modern translators to gain an accurate sense of the originals. The power and control available to the early church was unlike the modern Roman Catholic establishment and cannot be compared with it. Christians were undergoing waves of persecution and heresy on an everyday basis. The religion was spreading fast organically. Christians universally viewed the church as an endeavor controlled by the Holy Spirit, not a private powerful group of men. It wasn’t until the 5th century that Rome consolidated significant power: in part because Rome was the political capital and in part because other regions of Christendom were in turmoil. It was the occasions of persecution and heresy that drove the church to recognize the cannon in its early days. The rise of Gnosticism was the chief threat. Valentinus’s heretical teaching on the Trinity left many in the church wondering how the Bible ought to be interpreted. In Rome, toward the middle of the second century, Marcion, organized his own cannon in which he excluded the “Law and the Prophets” as well as three out of four of the gospels. The church felt the need to respond to these errant teachings. Then “on February 23, 303 . . . [Rome] posted an edict banning Christian worship . . . [and] church officials were ordered to hand over their sacred books for burning.” Not only did the church need to defend the canon, but they needed to preserve it in order to maintain the faith. The New Testament was not accepted in one moment as a finished work. This is obvious simply from the construction of the canon itself. Each book was written for a different reason, audience, location, and over a span of time (A.D. 44-49 to A.D. 94-96). For example, Luke wrote the Gospel of Luke (A.D. 60-61) and Acts (A.D. 62) to Theophilus as a history, Matthew wrote to a Jewish audience (A.D. 50-60), Paul, the apostle to the gentiles, wrote many personal and corporate letters much of the time in reaction to issues individuals and churches were having (A.D. 49-50 to A.D. 66-67) , etc. The early church never assumed that the canon was suddenly revealed from heaven in a final form. They believed instead that God progressively used fallible men to accomplish His purpose in both authoring and preserving the canon. There are other books outside these, which are not indeed included in the canon, but have been appointed from the time of the fathers to be read to those who are recent converts to our company and wish to be instructed in the word of true religion. These are the Wisdom of Solomon, the Wisdom of Sirach, Esther, Judith, Tobit, the so-called Teaching of the Apostles [Didache] and the Shepherd. But while the former are included in the canon and the latter are read, no mention is to be made of the apocryphal works. They are the invention of heretics. As is demonstrable, the council participants were not seeking to establish a canon of their own, but rather to recognize a canon that had already been given. The process of canonization is a testimony to the early church’s incapability of strong-arming itself into a position of acting as the Bible’s authority. There was no way for the early church to eradicate texts it thought undesirable or build a consensus toward totalitarian control if the desire had been there. Councilmen viewed themselves as truth affirmers, not makers. They simply believed what the Scripture said about itself. The most common passage quoted when discussing biblical authority is 2 Timothy 3:16-17 which states, “All Scripture is inspired by God and profitable for teaching, for reproof, for correction, for training in righteousness; so that the man of God may be adequate, equipped for every good work.” What is it that makes men “equipped for every good work?” It is not the church’s authority, but rather Scripture itself. The word “inspired” literally means, “god-breathed.” The New Testament’s authority comes as much from God as the Old Testament’s “Thus Saith the Lord,” comes from God. Commenting on this statement Dr. James White explains, “It is both a positive statement, asserting the supremacy and uniqueness of the Word, and a negative one, denying the existence of any other rule of authority on the same level.” A second passage for consideration is 2 Peter 1:21 which states, “But know this first of all, that no prophecy of Scripture is a matter of one’s own interpretation, for no prophecy was ever made by an act of human will, but men moved by the Holy Spirit spoke from God.” In context, Peter has just finished explaining his experience on the mount of transfiguration. He then switches gears to let his audience know in verse 19 that there is a word “made more sure” than even his own personal experience, and that word is revealed in verse 21 as the Scriptures themselves. The reason the Apostle Peter trusted the Scriptures over his own experience was because the Scriptures were given by God and not subject to ones “own interpretation.” The men who were used to write the canon Peter tells us were “moved (or “carried along”) by the Holy Spirit.” There are numerous additional passages attesting that there exists no higher authority than the Word of God. It is this view that was assumed by the early church, and because of it the Scriptures must authenticate themselves, since to put them under the authority of any man or group of men would be to fundamentally change their nature. Regardless of all the issues church fathers disagreed on, there is at least one dogma that boasts universal acceptance. The early church believed in sola scriptura. If ever there was a conspiracy, it was a conspiracy to establish the Bible as the sole authority for faith and practice. “Hippolytus of Rome (170 – 235 A.D.) was the most important third century theologian in the Christian Church in Rome.” He was the disciple of Irenaeus: a disciple of Polycarp, who knew well the Apostle John. Hippolytus wrote an incredible amount of Christian material most notably the Refutation of All Heresies. He died as a martyr in 235 A.D. under the persecution of Emperor Maximinus Thrax. Hippolytus had this to say about the cannon. There is, brethren, one God, the knowledge of whom we gain from the Holy Scriptures, and from no other source.... Whatever things, then, the Holy Scriptures declare, at these let us look; and whatsoever things they teach, these let us learn. The exclusivity of Hippolytus’s statement is noteworthy. He does not give any credence to the church or “tradition,” instead outlawing them as refuges by which to escape from sola scriptura. Another stalwart against Arianism was Basil of Caesarea (329 or 330 – 379 A.D.). Labeled among the Cappadocian Fathers and influential in championing the Nicene Creed, Basil was also involved in making his mark on early monastic life as well as succeeding Eusebius as the Bishop of Caesarea. Although there are no doubt issues which many modern Protestants may disagree with Basil on, he would have no qualms about sola scriptura. We ought carefully to examine whether the doctrine offered us is conformable to Scripture, and if not, to reject it. Nothing must be added to the inspired words of God; all that is outside Scripture is not of faith, but is sin. Basil could not have been clearer. Not only is Scripture of the highest authority, anything deviating from it is sinful. The Nicene Creed was therefore only a support beam for the Scripture, not a replacement for or an assistant to them. On a separate occasion, Basil had this to say to a Christian widow. This may surprise many modern Catholics. One of the “Doctors” of the church believed that a bishop is of no help in individually applying the Scripture. Basil did of course believe in the office of pastor, but he considered it the layman’s responsibility to examine what was being taught and compare it to Scripture. Another influential bishop was Basil’s brother Gregory of Nyssa (c. 335 – c. 395 A.D.). Gregory was also a champion of Trinitarian theology and participated in the synod at Ancyra, the Synod of Antioch, and the First Council of Constantinople. Today he is considered a saint in Roman Catholicism, Eastern Orthodoxy, Oriental Orthodoxy, Lutheranism, and Anglicanism. Gregory’s views match those of his brother: “We make the Holy Scriptures the canon and the rule of every dogma; we of necessity look upon that, and receive alone that which may be made conformable to the intention of those writings.” Everything, from Gregory’s point of view, must be “conformable” or “made to fit” into the “intention” of the Bible. This would mean everything that deviates from it is illegitimate. Cyril of Alexandria (c. 376 – 444) was a very influential bishop in the patristic period of the church. Often referred to as Pillar of Faith or Seal of all the Fathers, Cyril served as the Patriarch of Alexandria and was a central figure in the First Council of Ephesus. Cyril, one of the most powerful forces in the Christian world at the time, even rubbing shoulders with the emperor, had much to say about sola scriptura. Let us then speak concerning the Holy Ghost nothing but what is written; and whatsoever is not written, let us not busy ourselves about it. The Holy Ghost Himself spoke the Scriptures; He has also spoken concerning Himself as much as He pleased, or as much as we could receive. Let us therefore speak those things which He has said; for whatsoever He has not said, we dare not say. Concerning the divine and holy mysteries of the Faith, not even a casual statement must be delivered without the Holy Scriptures; nor must we be drawn aside by mere plausibility and artifices of speech. Even to me, who tell you these things, give not absolute credence, unless you receive the proof of the things which I announce from the Divine Scriptures. For this salvation which we believe depends not on ingenious reasoning, but on demonstration of the Holy Scriptures. In other words, Cyril sought to restrain himself from dogmatically forwarding any opinion found outside of Scripture for the simple reason that salvation depends on Scripture. What else is of importance? Notice also how Cyril places the Scriptures above even human reason. Lastly, it is important to examine St. Augustine (354 – 430 A.D.), perhaps the most respected man in all of church history excluding the Apostles themselves. St. Augustine’s words ring true in the corridors of Christianity of every age. Let us treat scripture like scripture, like God speaking; don’t ... look there for man going wrong. It is not for nothing, you see, that the canon has been established for the Church. This is the function of the Holy Spirit. So if anybody reads my book, let him pass judgment on me. If I have said something reasonable, let him follow, not me, but reason itself; if I’ve proved it by the clearest divine testimony, let him follow, not me, but the divine scripture. Augustine demonstrates what can be considered to be great humility. His desire is for Christians to look to Scripture, not to him. It is telling what the great theologian says about the relationship of Scripture to the church. “The canon has been established for the Church.” This statement simply implies that it was not the church that established the canon, but rather the other way around. The church would have no authority if it wasn’t for the canon—the canon of Scripture given by God. As has been demonstrated throughout this work, the church viewed the Scripture as the self-authenticating word of God relying on no higher power than itself. First the process of canonization was examined and it was demonstrated that the early church did not have the option available to destroy variations in the text it disagreed with. Secondly, the early church’s goal was to preserve, as instruments of God, what was recognized by God as Scripture. Thirdly, the canon bears in itself the doctrine of sola scriptura. Fourthly, the early and patristic church fathers were unified in extolling the viewpoint Scripture has about itself. They placed themselves under its authority, not the authenticity of Scripture under theirs. Alexandria, A. Against the Heathen. Fig, n.d..
Boer, H. R. A Short History of the Early Church. Eerdmans, 1976. Brighenti et al. The Catholicism Answer Book: The 300 Most Frequently Asked Questions. Calvin, J. Institues of the Christian Religion. Hayes Barton Press, n.d.
Caner, E. The Popular Encyclopedia of Apologetics: Surveying the Evidence for the Truth of Christianity. Harvest House Publishers, 2008. Chapman, S. B. The Law and the Prophets: A Study in Old Testament Canon Formation. Mohr Siebeck GmbH KG, 2000. Ferguson, Everett. Church History. Grand Rapids, Mich: Zondervan, 2005. Gambero, L. Mary and the Fathers of the Church: The Blessed Virgin Mary in Patristic Thought. Ignatius Press, 1999. Hardon, J. A. The Treasury of Catholic Wisdom. Ignatius Press, 1987. Jeffrey, D. L. Houses of the Interpreter: Reading Bible, Reading Culture. Baylor University Press, 2004. Jerusalem, S. C. Catechetical Lectures. OrthodoxEbooks, n.d.
Killian, J. Truth of Our Faith. iUniverse, 2011. MacArthur, J. The MacArthur Bible Commentary. Thomas Nelson, 2005. McDowell, J., and S. McDowell. The Bible Handbook of Difficult Verses: A Complete Guide to Answering the Tough Questions. Harvest House Pub, 2013. Newman, J. H. Select Treatises in Controversy with the Arians. John Henry Parker, 1842. Roberts, A. The Ante-Nicene Fathers. Christian Literature Publishing Company, 1888. Rubenstein, R. E. When Jesus Became God: The Epic Fight over Christ’s Divinity in the Last Days of Rome. Houghton Mifflin Harcourt, 2000..
Schaff, P. Nicene and Post-Nicene Fathers Second Series, Basil: Letters and Select Works. Cosimo, 2007. Schaff, P. Nicene and Post-Nicene Fathers Second Series: Cyril of Jerusalem, Gregory Nazianzen. Cosimo, 2007. Schaff, P. Nicene and Post-Nicene Fathers: Second Series Volume IV Anthanasius: Selects Works and Letters. Cosimo, 2007. Schaff, P., and H. Wace. A Select Library of Nicene and Post-Nicene Fathers of the Christian Church: St. Basil: Letters and Select Works. 1895. Christian literature Company, 1895. VanderKam, J., and P. Flint. The Meaning of the Dead Sea Scrolls: Their Significance For Understanding the Bible, Judaism, Jesus, and Christianity. Bloomsbury, 2005. Voerding, P. The Trouble With Christianity: A Concise Outline of Christian History: From the Traditional Western Birth of Christ (Pbuh) to Contemporary American Evangelical Fundamentalism. AuthorHouse, 2009. White, J. R. Scripture Alone: Exploring the Bible’s Accuracy, Authority and Authenticity. Baker Publishing Group, 2004. White, James. “Francis Beckwith Begins to Give His Reasons (#3).” Alpha and Omega Ministries, June 7, 2007. http://www.aomin.org/aoblog/index.php?itemid=2033.